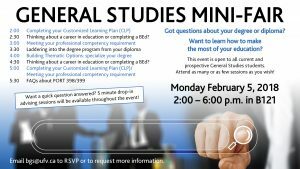 Have questions about your degree or diploma? Want to learn how to make the most of your General Studies education? 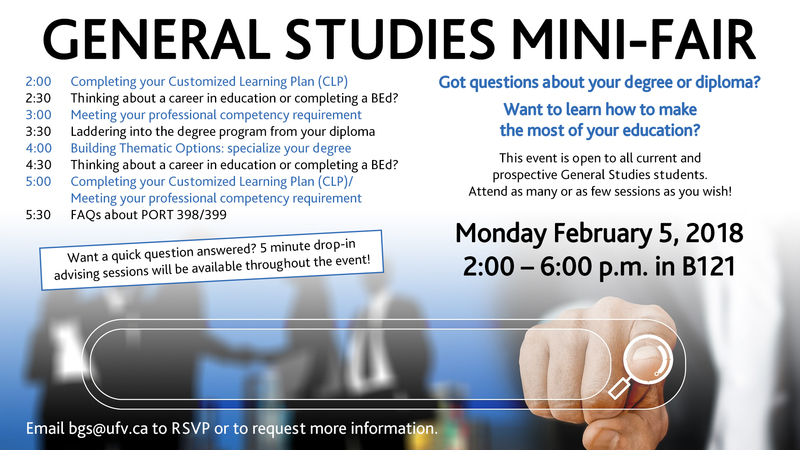 Open to all current and prospective General Studies students, this event will feature a series of 30-minute information sessions regarding the most important areas of the program. Topics include: completing the Customized Learning Plan, meeting your Professional Competency requirement, building Thematic Options, transitioning into the degree program from the diploma, Portfolio planning, and laddering into a career in education or completing a BEd. 5-minute drop-in advising sessions will also be available throughout the event. Check the posters around campus for a detailed schedule breakdown. Email bgs@ufv.ca to RSVP or to request more information.